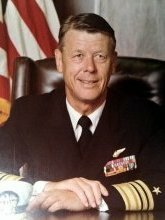 Vice Admiral, USN (Ret.) Robert F. "Dutch" Schoultz, a Naval Aviator for 43 years, made his Last Take Off at 2:30 AM on 9 October 2017. Born in Racine Wisconsin in 1925 and was raised in Omaha, Nabraska. He entered the Navy to fly in 1943, earning his wings in 1945. He served in the Navy until 1987 retiring as a Vice Admiral. During his long career, he commanded aircraft carrier-based attack squadron VA-93, commanded the USS ARNEB LKA-56 and the aircraft carrier USS FORRESTAL CVA-59 from June 1971 to November 1972. He commanded Carrier Battle Force SIXTH Fleet CCG2, and Commanded Naval Air Forces Pacific. His final two tours in the Navy were as Deputy Chief of Naval Operations Air Warfare, and Deputy Commander in Chief US Naval Forces Europe. During his Navy career, he was awarded three Distinguished Service Medals, three Legions of Merit, the Bronze Star Medal, among many other decorations. After his retirement from the Navy, Dutch worked for many years as a consultant to a number of defense contractors supporting the United States and allied militaries. He spent his later years actively engaged with friends and the golf communities in Prescott and Sun City, Arizona. Dutch had a contagious love for working with people; he had a unique gift for bringing people together and injecting fun into whatever they were doing. His personal motto was "If you ain't having fun doing it, you ain't doing it right." People loved working with and for him because he always had fun, made people feel good about themselves and the work they had to do together. Dutch is survived by his wife Rosemary, with whom he was married for nearly 68 years, their sons Bob and Scott, four grandchildren and a great granddaughter.